You are being invited to take part in a research study which is trying to understand what life in HMP Oakwood is like for the people who spend time there. Before you decide whether or not to take part, it is important for you to understand why the research is being done and what it will involve. Please take time to read the following information carefully. If you agree to take part then you will be invited to take part in an interview. During this interview, we would like you to share your experiences and opinions on how life in prison might be related to prison architecture and design. Please be sure to let the researcher know at any time during the interview if you have any questions, feel uncomfortable, or wish to terminate the interview. The interview should take about an hour and will be arranged in a time and place that is convenient to you. It is up to you to decide whether or not to take part. If you do decide to take part you will be asked to sign a consent form. If you decide to take part you are still free to withdraw at any time and without giving a reason up to two weeks after our meeting. What should I do if I want to take part? If you do wish to take part in this study or you are unsure about whether you want to take part and/or have any questions then please get in touch using the contact form below. 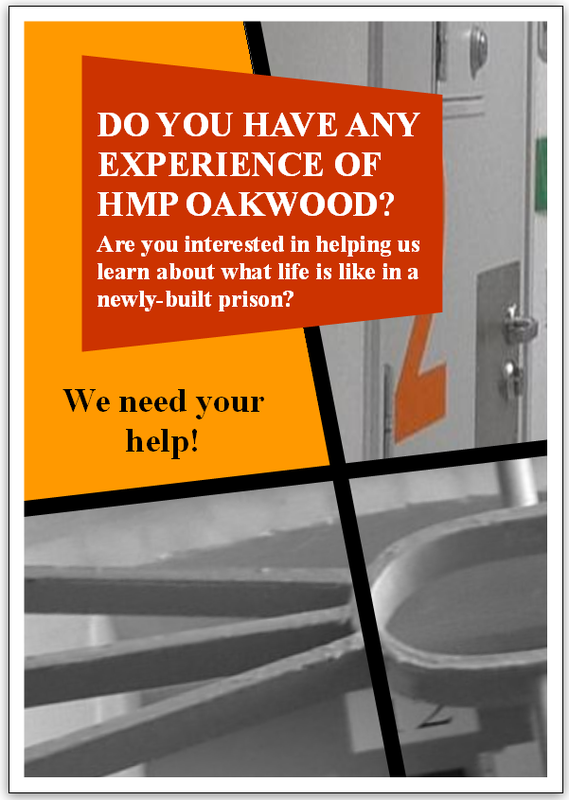 This is your opportunity to tell us about your experience of HMP Oakwood and what it was like to be housed in a new facility. Oakwood is the ‘model’ for other prisons being built in England and Wales and we hope to influence future prison design strategy with our research findings, so your experience is very valuable and your opinion matters. What are the possible disadvantages and risks of taking part? There is no known harm to you as a consequence of taking part in this study. Will what I say in this study be kept confidential? The researcher conducting the interview is ethically bound to maintain your privacy and personal rights at all times. All of the interviews will be recorded on a digital Dictaphone. You will not be named on the Dictaphone and each participant will be assigned a code to ensure anonymity. All responses will be completely confidential. In any reports or publications, your responses will not be described using your name or any information that could identify you personally. Where necessary, we may use a fictional name but may say which prisons you mention. All information will be collected, stored and disposed of securely in accordance with the Data Protection Act 1998. Any data stored on a computer or lap-top will be password protected. The information will be stored for ten years after the completion of the research project and may be shared and stored in a research depository. This means that the information may be shared with other researchers but in an anonymised format. Therefore you will remain unrecognisable as a participant in the study. The research team will be the only people to have access to the original recordings of the interview, your consent form and any of your contact details. The results of this study will be used as the basis for an academic study and will be used to write reports, academic articles, and inform presentations for conferences. Click this link to get in touch via the form here or you can write to us at FREEPOST PRISON SPACES (all capital letters, no stamp required).